Deportation “Charter” flights are when immigration authorities hire a whole aircraft to deport lots of people at once. Charter Flights currently run from the UK to Afghanistan, Nigeria, plus the “new routes” of Sri Lanka, Ghana and Pakistan. In the past, they have gone to Iraq, Cameroon, DR Congo, Jamaica, Kosovo & Albania. There is no reason to want to ‘delay the process’ and spend longer locked up in immigration detention unless there is a real fear of going back. Looking at these destination countries it should be easy to see why people are ‘making a fuss’ at the airport. Indeed charter flights are generally used for deporting migrants to countries that have few commercial flights because they are serious conflict zones, like Afghanistan and Iraq. That success is dependent upon the (mis)use of force and violence that can be implemented on a private aeroplane – out of public presence, and the fact that deportation charter flights limit refugees’ access to due legal process. The UK Border Agency’s Enforcement Instructions and Guidance states that “charter flights may be subject to different arrangements where it is considered appropriate because of the complexities, practicalities and costs of arranging an operation.” Charter flight deportees are told that “removal will not necessarily be deferred in the event that a Judicial Review is lodged”. The emphasis is on filling the flight rather than ensuring the appropriate legal avenues have been exhausted or legal requirements adhered to – people who win last-minute High Court injunctions can be ’substituted’ by someone else who had not been served with removal directions. Standard practice on charter flights is for each deportee to be shadowed by at least two security guards, handcuffed and forced onto the plane under the threat of violence. Any disobedience or attempt to resist has been met with disproportionate force to ‘restrain’ the deportees. Although deportation charter flights were new and experimental in 2009, they are now well established. Some charter flights stop in several European countries on the way to collect more detainees. The consent of the destination country is required to issue detainees with Emergency Travelling Documents and allow detainees to disembark upon arrival. Military-style logistical planning and language is used throughout the process. Immigration authorities tend to move all detainees to detention centres around London a few days before the flight. Detainees are transported from the detention centres to the airport in several large coaches. Each coach has a “coach commander” onboard. The ratio of guards (“deportation escorts”) to detainees is 2:1. So for a flight that deports 70 migrants, there would be 140 guards involved. Other concerns raised include the use of handcuffs on detainees ‘who appeared upset, or who were moving too slowly, despite there being no signs of any violent behaviour which might have justified the use of such restraints’. Frontex is the European Union’s joint-border agency, responsible for policing the “external borders” of the EU. The agency has their shinny offices in Warsaw, Poland, and has been operational since 2005. It has an extremely realist mindset: seeing migration as a “threat” and carrying out extensive “risk analysis”. Most frightening is their use of UAV’s (drones) to patrol border zones, and deploying Naval Fleets to patrol the coast off Mauritania. In 2009, Frontex ran 32 charter flights, removing more than 1500 people from European territory. 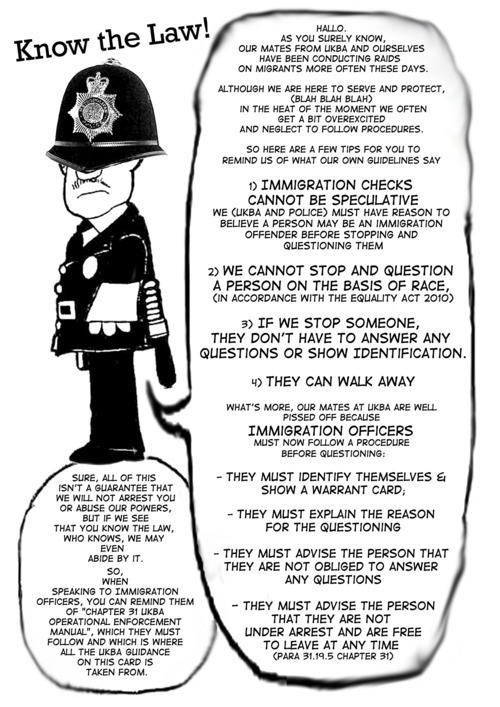 There have been a number of actions involving blockading the exits of the detention centres to delay the coaches reaching the airport, see indymedia.org for more information. Removal Directions for a Charter Flight? If a detainee is given Removal Directions, the flight numbers for Charter flights start with PVT … so look out for that first. It tends to be harder to stop a detainee being deported if they are on a charter flight. When there are many people from one particular country given Removal Directions for one date it is likely to be a charter flight. UKBA participated in 37 deportation charter flights from March 2011 to March 2012. In the financial year March 2011/March 2012, UKBA participated in 37 charter flights.